In my marriage to Takamatsu, we have come to recognize how often Fate has presented us with pleasant branches and intersections in our path together. And so it was that in our journey home to Nishijima, people and events arranged themselves at the right moments and places in time. The night of our party at Yordie’s Zen Garden, we celebrated the anniversary of the garden, but also bid it goodbye until the Spring. As guests arrived, I was feeling many emotions. 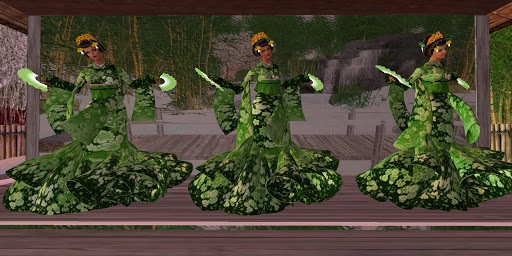 I could not see the guests as they arrived, and had no idea that my former onesan, geisha Masumi was in the audience. My sister performers and I prepared for the show inside the warmth of the teahouse, then we moved to the stage and kneeled as the final guests were seated. As the beautiful music of the shamisen began to play the beautiful song, “Bamboo Dance”, and our show began. Our geisha show went well with our breathtaking green kimonos, and the willowy, floating dances of partners, Magi-san and LeLe-san and me. I kept my nervousness controlled and told the story of that rabbit who crossed the sea. In the show my mind focused on the music, dance and telling of the story. I’d learned these skills in the many hours and months of training I’d received as an apprentice geisha. My teacher was the great geisha, Masumi san and after the show, to my surprise and delight, I learned that she had come all the way to Nishijima to see my show. And even more delightful, Taka informed me that Masumi had spoken with him during the show and that she liked my performance very much. After the show there wasn’t time for much chat, but in a brief chat Masumi asked me if I’d like to audition to be in her New Years Celebration show at the great Hosoi Ichiba market. Naturally, I was very honored and I accepted, although that was subject to my husband’s approval of course. 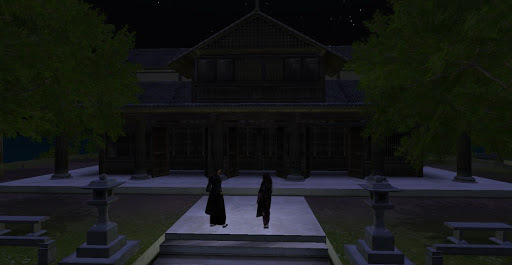 When all the guests had gone for the evening, Takamatsu and I spent a few more moments in our garden. Our return to Kansai would keep us from this place of serenity for many months. This succession of events surrounding the visit of my former onesan reaffirmed my husband’s and my shared belief that Fate smiles on us and seems guides us to along a path we might never have foreseen. And we realized an introduction into Masumi’s circle would serve us well as we seek information, and seek to learn about our the people of the community. In the days we’d spent back in our home, my husband concluded his business. And in every way, the party was a wonderful event and a fine farewell to our homeland. And then, the night ended and although we had slept late, the new day had begun. Our hired men were waiting for us with their horse & cart. It was now time to finish packing our clothing and other belongings, and have the men load their wagon for the journey. 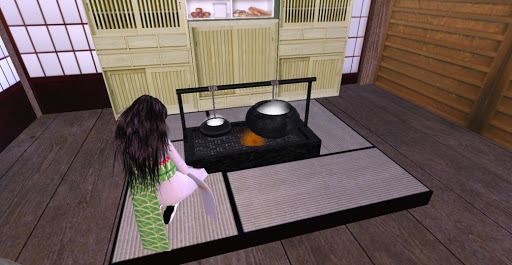 While Takamatsu supervised the men, I made a large pot of food for the journey. I’d miss my cozy kitchen with its large stove and fine pots, utensils and spices. I’d find a way though to make the small fire pit in our new home a center for inviting meals. The morning was fading as midday Sun beam on our party as we travelled the road back to Kansai. The road was firm and clear, and our men guided the wagon, leading the way along the rough road. My husband and I enjoyed rode on the wagon through the rough terrain, but also took some time to walk and enjoy the evergreen forest of bamboo trees, standing tall in fields of heavy snow. We talked again about now our fortuitous acquaintances and how they are easing us forward in our quest. I smiled and exclaimed, “Hai.” I had foreseen our nights, and moved the big pot with it’s delicious shrimp, rice and vegetables to the fire, to warm up for our dinner. This would be a meal fit for my wonderful Taka, and he smiled at me because he had a surprise of his own. Inside one of his wooden cases, Taka pulled out a bottle of my favorite sweet saki. And as the meal warmed in the fire bit, we sipped our saki. I smiled at Taka to let him know how very happy I was. The night’s hour was late and darkness was deeping as weather moved in. But before retiring for the evening, Taka wanted to take a short trip to a nearby dojo we’d seen in the recent past. It was a private home, so we knew our presence might not be appreciated so we moved quietly up the stairs. While I looked around the area for visitos, Taka took a look inside. He returned to me with a puzzled look. In just a few weeks since we’d first visited the dojo, it seemed the owner had moved out and a most unusual new owner, an artisan had moved in. We stood for a few moments, then left as the night and the weather continued to close in. There is a great deal we do not know about this community. Patience would have to be our guide as we learn, but the way seems clear and we have decided to allow the good fortune enjoyed to pave our way forward. And what a wonderful upcoming event we have on our horizon, the New Years Celebration, and The Year of the Rabbit!